Somkid Jatusripitak, an economist and Thailand’s Deputy Prime Minister, has been busy as of late drumming up new business and investments for the country’s brash, new Eastern Economic Corridor (EEC) initiative. The EEC is a massive 5,000 square miles stretching along the Gulf of Thailand from the province of Rayong to those of Chonburi, and Chachoengsao. Thailand’s intention is for the EEC to become a high-tech manufacturing hub (there’s even a smart city in the plans). A similar, national mega-project from the 1980s catapulted Thailand into industrial leadership in the ASEAN (See: Maps). Thirty-five years on, however, Thailand, although still an industrial powerhouse in Asia ($400 billion GDP), has witnessed its GDP growing unspectacularly; its per capita GDP half what it should be; and its GDP growth rate sluggish at 3.7 percent. Most point to overdependence on manual labor and over-reliance on its seemingly inexhaustible trove of rich agricultural resources for its current plight. Thailand needs all the help it can get. The prospect of an EEC success has the country’s leadership hoping that lightning will strike twice. Of course, the aid of some close friends like Japan and China are very much needed. Thailand’s current status finds itself teetering on the edge of the dreaded middle- income trap, where wage inflation makes industries less competitive. Jatusripitak, along with most everyone else, blames the country for failing to upgrade technology and foster skilled workers. Fortunately for Jatusripitak, 2018 opened with fresh promise. “Thailand’s GDP soared to a five-year high in Q1 of 2018. The Thai economy grew by 4.8 percent…surpassing predictions.” The surge has prompted a reassessment of its growth predictions for the year, forecasting 4.2- 4.7 percent. Also encouraging, the country’s first quarter exports rose by 11.3 percent, their highest level in seven years. Good news enough for Jatusripitak to use during major talks with Japanese investors in Tokyo and his recently concluded Bangkok sales pitch to a task force of over 500 Chinese industrialists. To prime the investment pump, the Thai government has just authorized $45 billion in what the Nikkei Asian Review tabs a do-or-die leap to a technology-driven economy. Over $6 billion is slated for robotics and logistics upgrades. 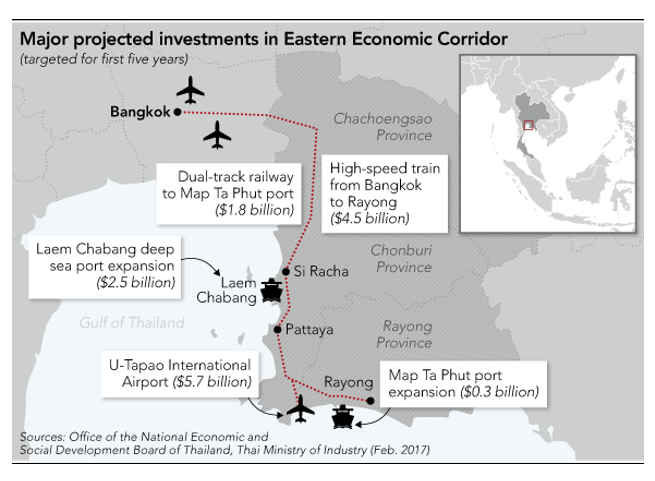 A government slide presentation promoting the EEC lists a string of projects to be pursued: $1 billion for highways; $2.8 billion to expand ports; $6 billion to upgrade the U-Tapao International Airport; $6.7 billion to build railways, including one for high-speed trains; $12 billion for new cities and hospitals and $15 billion for industry. The EEC’s ten targeted industries: Next-gen automotive, intelligent electronics, tourism for high-income tourists and medical tourism, agriculture and biotechnology, food processing, robotics, logistics, and aviation, including biofuels and biochemicals. According to Industry Minister Uttama Savanayana, the EEC project will be particularly kind towards robotics, even going so far as to encourage Thai businesses to adopt robots and robotics technologies into their manufacturing and production processes. Government-sponsored video offers up a good look at all the moving parts to the massive EEC project. Savanayana rightly sees a strong relationship between increased productivity and the deployment of industrial robots. “As part of the plan, the government will support the creation of a corps of systems integrators – experts who solve production and operational challenges using the highest and most appropriate technologies available. Thailand has about 200 such experts, but the government wants to see 1,400 in five years. About 30 percent of manufacturers in Thailand are already using robots, but the government wants that to rise to 50 percent in five years. Jatusripitak’s Tokyo meeting went well, with a survey among attendees showing a favorable leaning toward increased investment: 53.6 percent of the respondents said they see the corridor as strategically important to their businesses. Close to 80 percent said they consider the corridor’s inducements to be effective.” Japan, with over 5,000 businesses operating in Thailand and a 130-year history of Thai/Japan business dealings, has long viewed Thailand as a key component in its Mekong Five economic plans (Cambodia, Thailand, Vietnam, Myanmar and Laos). However, one important dissenter was Hiroyuki Ishige, chairman of the Japan External Trade Organization (JETRO), who had “some misgivings, like the country’s aging population and a relatively unskilled workforce.” He said he is not “necessarily optimistic” about Japan continuing to be Thailand’s top source for foreign direct investment. Then, of course, there is China, which is always more than willing to extend its hegemony, especially into strategically important geography like Southeast Asia. Even before the August (2018) meeting in Bangkok with 500 Chinese industrialists, Thailand was important to China’s Belt & Road plans. In the port of Laem Chabang, the country’s largest deep-water port (Chonburi), three, remote-controlled container cranes from Shanghai Zhenhua Heavy Industry are undergoing final inspections. Jack Ma’s Alibaba Group Holding has expressed interest in setting up a logistics center in the EEC. Huawei is investing $15 million to set up one of its OpenLabs in Bangkok to support digital transformation.” And then there’s the all-important $6.8 billion Belt & Road Thai-Chinese railway line that will link Thailand and China through Laos. The Bangkok meeting with the Chinese was billed as Thailand – China Business Forum 2018: Strategic Partnership through the Belt and Road Initiative and the EEC, which hints at the notion that it’s just the beginning of Chinese influence descending on Thailand. A dozen or so MOUs and lots of investment probing (nothing firm) issued from the Bangkok meeting. The next three years are important for Thailand. They will definitively show whether or not Thailand is seriously transforming itself into a technology-driven economy, which also necessitates the education and training of a modern, high-tech workforce. JETRO claims that its Thai-based Japanese businesses are finding it difficult in hiring enough engineers. With natural resources aplenty, powerful business alliances at the ready, and a government putting up lots of cash for starters, Thailand’s EEC has a remarkable opportunity before it to catapult the country once again.